Mikhal Dekel has written a complex, literary, and often witty analysis of what she calls the ‘Zionist Moment.’ Through sophisticated readings of texts as different from each other as Bialik’s ‘In the City of Killings’ and George Eliot’s Daniel Deronda, Dekel brilliantly interweaves several important threads in the construction of modern Jewish political identity: gender, nation and the tragic. The result is a rich intellectual tapestry. … a literary study that concentrates on the early Zionist movement, both affirms and complicates on the interplay between masculinity and Zionism. . . Dekel offers a sophisticated reading of George Eliot’s Daniel Deronda and its reception within the early Zionist movement, Theodor Herzl’s Altneuland and a range of other works. 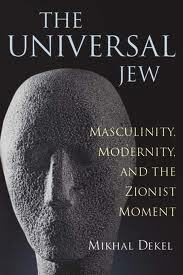 The Universal Jew is not an easy book, but Dekel’s refusal to offer simplistics readings is welcome. Ultimately, the book suggests that the problematic aspects of early Zionist writing, including its construction of gender, sprang from the same questions and anxieties that other European writers were dealing with at the time. … explores in ways uniquely its own the construction of the modern Jewish national subject in turn-of-the-century literary and nonliterary writing. By demonstrating in particular that Daniel Deronda‘s English- and Hebrew-langauge reception formed mirror images of each other, Mikhal Dekel has uncovered one of the great ironies of the modern history of the novel and its intersection with the history of nationality. The Universal Jew analyzes literary images of the Jewish nation and the Jewish national subject at Zionism’s formative moment. In a series of original readings of late nineteenth-century texts—from George Eliot’s Daniel Deronda to Theodor Herzl’s Altneuland to the bildungsromane of Russian Hebrew and Yiddish writers—Mikhal Dekel demonstrates the aesthetic and political function of literary works in the making of early Zionist consciousness. More than half a century before the foundation of the State of Israel and prior to the establishment of the Zionist political movement, Zionism emerges as an imaginary concept in literary texts that create, facilitate, and naturalize the transition from Jewish-minority to Jewish-majority culture. The transition occurs, Dekel argues, mainly through the invention of male literary characters and narrators who come to represent “exemplary” persons or “man in general” for the emergent, still unformed national community.